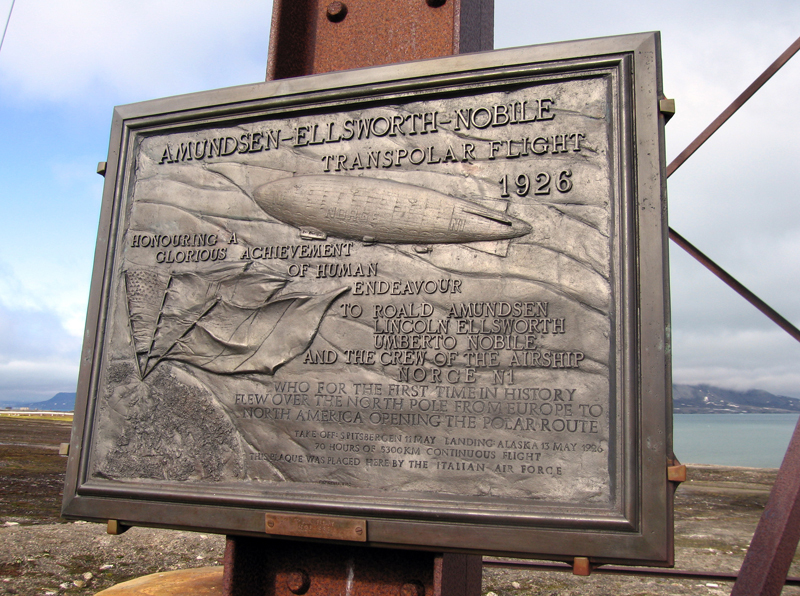 There is a monument in Tromsø, Norway dedicated to the loss of the men of the Italia which crashed on the ice at Svalbard on 25 May, 1928, and a commemorative plaque to the Pole crossing in 1926 by the airship Norge located at Ny-Ålesund. In May 1928 several polar flights were attempted by the Italia. The expedition was based at Ny-Ålesund (Kings Bay) Svalbard. On May 23, the Italia headed for the pole. At their destination, they were unable to land due to high winds. On May 24th, they began the return trip to Ny-Ålesund. Strong headwinds dramatically slowed their progress. On May 25th, serious problems with icing and control surfaces led to an inability to control the airships flight. 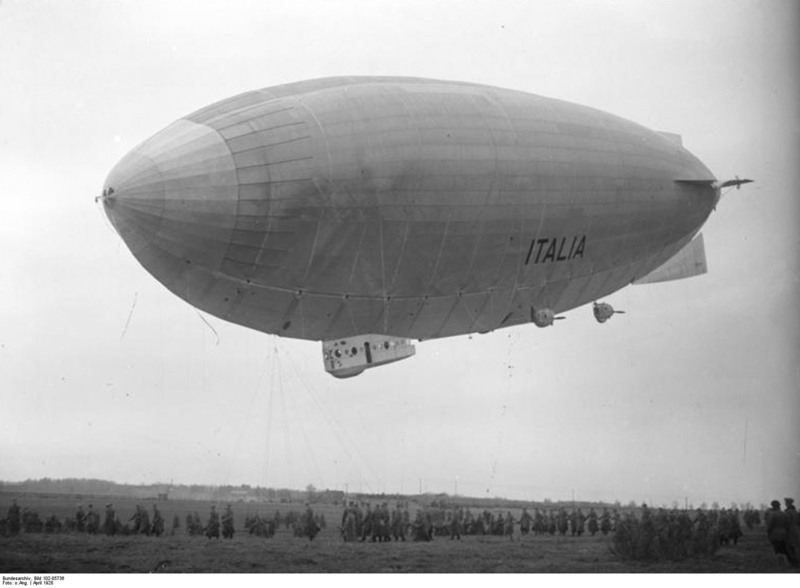 In a tail-heavy condition and descending uncontrollably, the Italia impacted the ice. The control car was split open, 10 of the crew members were thrown to the ice by the impact and some equipment as well. With the loss of the weight of the crew and equipment, the envelope of the Italia, still holding 6 crew members, ascended and drifted away and was never found. The crash was about 120 km (75 mi) northeast of Nordaustlandet, Svalbard. Survivors, now stranded on the ice, found a working radio in the debris, and were able to send an SOS. Throughout June and July rescue operations are attempted with tragic results, ultimately concluding the rescues on July 14th. Eight of the crew of the Italia had died, and nine rescuers perished. 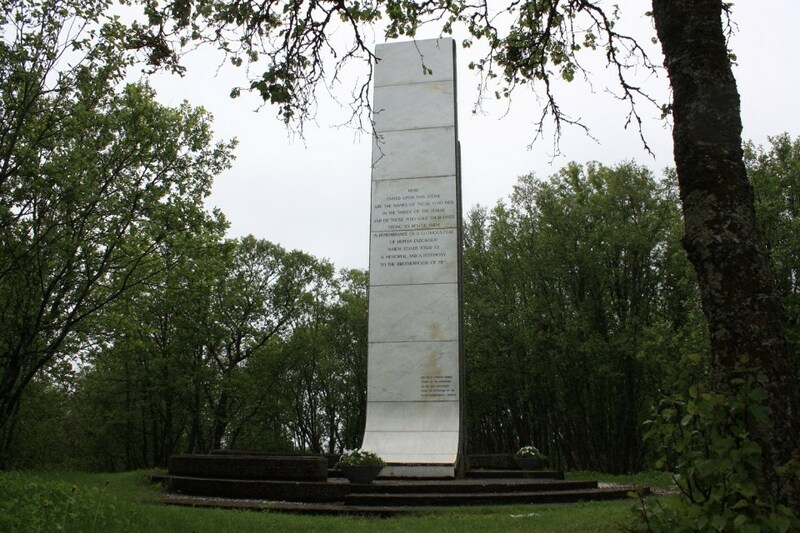 In 1969, expedition leader and survivor Umberto Nobile, and the Italian Geographic Society erected a monument to the Italia and to those of her crew who lost their lives and to those rescuers who lost their lives in the rescue attempts. The monument to the Italia is located at (Lat Lon) 69.633016 018.909305, at Tromsø, Norway. On one face of the memorial it reads: "Here united upon this stone are the names of those who died in the wreck of the Italia and those who gave their lives trying to rescue them. In remembrance of a glorious feat of human endeavour which stands today as a memorial and a testimony to the brotherhood of men." On the other face, inscriptions include the date of the Italia crash and the crew members who died, and the dates of the failed rescue attempts along with the names of the rescuers who died. There is an excellent photo journal of the Monument here: aerosteles.net/stelefr-tromsoile-latham. 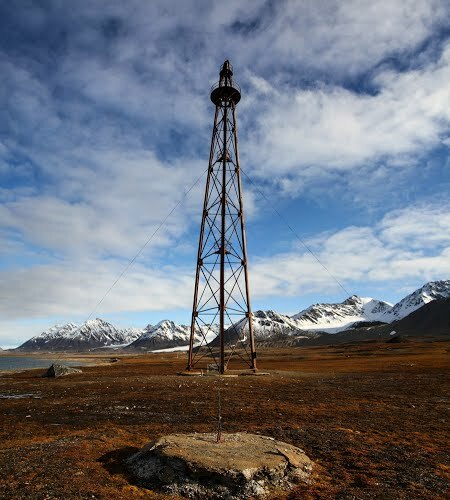 In the settlement of Ny-Ålesund on the archipelgo of Svalbard is a monument to the crossing over the North Pole by the airship Norge in 1926. Still standing on the island is the mooring mast used for the airship expeditions of both the Norge and the Italia. Affixed to one of the legs of the mast is a bronze plaque commemorating the polar crossing. The monument to the is located at (Lat Lon) 78.921543 011.946224, at Ny-Ålesund, Svalbard, Norway.